Inder Loves Folk Art: Summertime. Things have been pretty quiet around here. While the rest of the nation suffers through terrible heat waves, we're just pleased to have a bit more sun than usual. I haven't sewed a lot, but I've been cooking up a storm trying to keep up with our garden produce. The summer squash season isn't over yet, and the tomato and cucumber seasons have just begun! Frankly, I'm a bit overwhelmed right now. One of these days, I'll come home and I'll have to machete back tomato plants to get to my front door. I grew all of this! Meanwhile, baby Maggie is just growing and growing. Check out her chin(s)! The first couple times Joe held Maggie, we ran for the camera and asked him to pose for a photo. So now Joe first asks to hold Maggie, and then insists that we "take a picture!" Ha. Yeah, I made Joe's t-shirt and my dress/nightie. Maggie is in her "Cancer" PJs. It's hard to believe (and definitely a little bittersweet), but Maggie is almost a month old, and weighs well over nine pounds now! I keep hinting that, really, she doesn't need to grow that fast, but she's not listening. 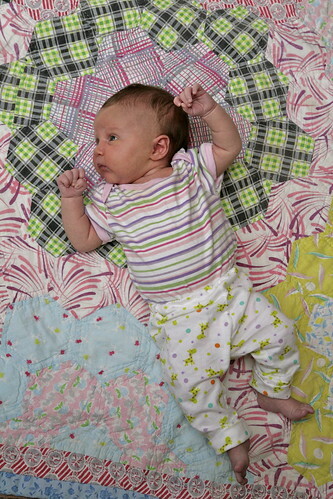 It is fun to watch her grow relative to the hexagrams in the beautiful quilt Christine made for her. Christine made that quilt, and I made Maggie's pants. 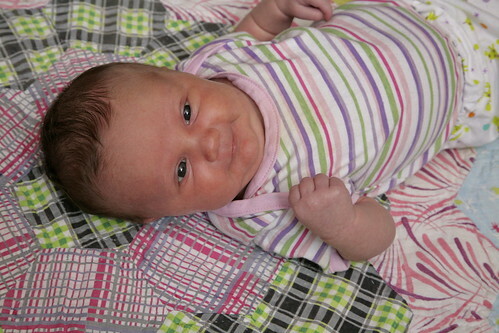 Whoever said that newborns don't smile hasn't met Margaret Joy. She comes by her middle name honestly. 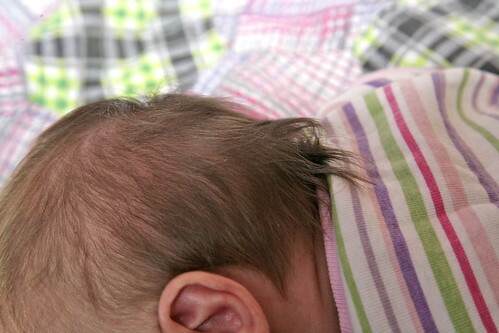 And she's still mullet-tastic (I think it's even growing!). Inder she is so, so gorgeous! Glad to hear she's growing well now. I am also rather jealous of all that garden produce. I think it's a good karma payback for the hell you went through with the lead soil thing! Joe is such a cutey! Gorgeous! Love her little smile how sweet! OH. MY. GOODNESS. Gorgeousness everywhere. 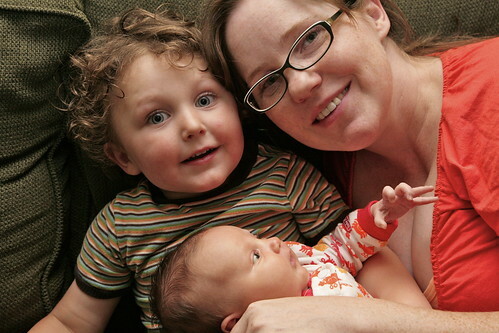 That third photo with you and your son looking at who is taking the picture so lovingly and your baby gazing up at you is just all family love love love. I love it. Oh, yum! The vegetables and the newborns baby chubs ;) I love how bright Joe's eyes are in that pic. You all are a photogenic family!